For us, the love of chicken tenders—also known as chicken fingers or chicken nuggets—started at fast food restaurants with indoor playgrounds. When my boys were toddlers, we went to those places with arches for a break from Seattle winter weather. Chicken fingers became an obsession (not to mention the pasty, salty, so-called french fries). It was a cheap date – but it cost us later. 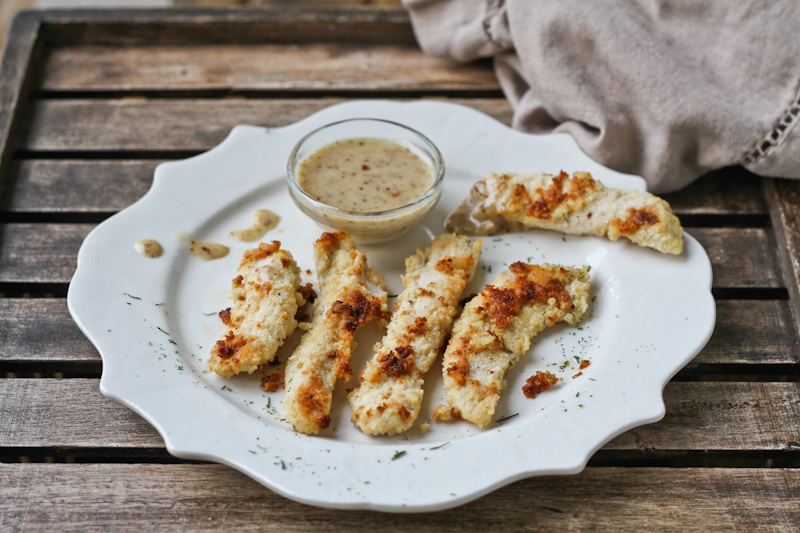 Here is a recipe for chicken tenders using almond flour, olive oil, mustard, egg, and some seasonings. You can eliminate the egg if you need to because most of the flour will stay on the chicken between dipping it in the seasoned flour and into the frying pan. The recipe for the honey mustard dip is here. Enjoy! Preheat frying pan on medium heat. Add cooking oil. In a bowl, add the chicken pieces, egg, and mustard, and mix with a spoon until well blended. In a dry bowl, prepare the batter by mixing the almond flour, salt and dill with a fork. Dip each piece of chicken into the batter to fully coat it and then straight into the frying pan. Fry each side of each chicken piece for about 5 minutes or so. Place the chicken nuggets on a plate and enjoy! I eat them straight up, but they go great with a side of grapes, melon, or - yes, dare I say... ketchup. Thanks for commenting! My family loves these (me too!) And thanks for the kind words. I just peaked at your blog – I love your ideas! I’ll be going back soon to read it all. I just made these over the weekend and they were delicious! I was really excited to find your blog (I have my own SCD food blog), there are tons of great recipes. I shared a link to this on my page. Yum! All of your recipes look and sound delicious! Have you tried using coconut flour to coat food for frying? I was wondering if that might be an alternative to the almond flour? Angie, I haven’t tried coconut flour yet. Interesting idea. I have tried shredded coconut on shrimp – it was ok. Let us know if you have success (if you try it). my husband is alergic to anything with nuts. do you think coconut flower would work? Hi Kimberly. 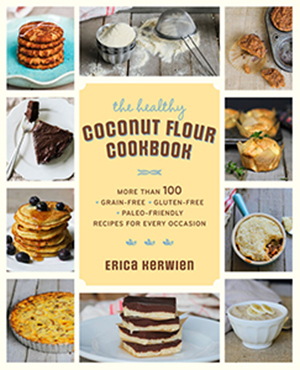 I haven’t tried, but it might work – I would try a very light layer since coconut flour absorbs so much liquid. I’ve had success using shredded coconut on shrimp (I add some honey to the dipping mix because I use unsweetened shredded coconut). If you can use other gluten-free flours, quinoa flour might work well. Let us know if you try it. These are incredible!! This time I added more salt and dill (to be sure to almondy taste was covered up completely). My favorite part was a couple tablespoons of sesame seeds I also added to the almond flour. Reminded me so much of fast food. Then I dipped them in honey mustard dressing (though they didn’t really need it – they tasted so good on their own). So exciting. As always, thanks! Can’t wait to see what you come up with next! I just used buckwheat flour to make the nuggets. They were delicious. nutty taste. Buckwheat is a fruit berry. Is it ok if I leave out the Mustard? I am not sure where I can find legal SCD mustard. oh, yes. It does add a bit to the flavor, but no worries. Most mustard brands should be SCD legal though. It should have three or four simple ingredients (mustard seeds, salt, vinegar, maybe wine). Enjoy! I forgot to add the dill, but the chicken turned out just fine without it. I’m sure this will become a regular in my household. Easy, quick, tasty–what more could one ask for? These are fabulous! So easy, quick and packed with flavour! I’ll eat these any time! I actually mixed the mustard, dill, salt and chicken together and left it in the fridge for a few hours. When I came home they were ready to fry upamd tasted just as yummy! !